“Outdoor living” is a term commonly used by landscapers to describe areas that have been designed to extend beyond the livable area of your home – right into your yard. When it’s properly designed, an outdoor living area allows life to flow easily from indoors to out. Installing an outdoor living area does more than just increase your home’s livable and functional space; it also adds to your quality of life. Why spend money on a resort getaway to recharge your batteries when you can get that same refreshed feeling in your own yard with a thoughtfully designed outdoor area? Ranging from a simple patio to a complete outdoor entertainment area for wining and dining your family and friends, ALD can do it all. Outdoor living areas take on a variety of looks and styles depending on the design, structures, lighting, and other landscape elements involved. As always, our designs are completely customized for each client, so you can be sure you’ll have an outdoor space that you can call completely your own. Imagine walking out of your house and into another room, but one without walls. Just because you’re outside doesn’t mean your outdoor areas can’t be useful and beautiful. It’s too hot in the summer to be cooped up in a hot kitchen. Why not move your cooking outdoors with an outdoor kitchen? Outdoor kitchens continue to be one of the most popular trends in contemporary landscape design. Once just a simple grill and picnic table setup on the patio, the outdoor kitchen has evolved into a all-inclusive food prep and cooking station, complete with dining areas capable of accommodating multiple guests. The outdoor kitchen has truly become a place to get together, eat, drink and be merry. No matter your budget or the constraints of your yard, we can design and install an outdoor kitchen to fit your needs and your property. Our designs can be as simple as a kitchen consisting of custom stone counter surrounds for your grill, and shade for the cook and the dining area. Or we can create an area that’s got all the comforts of your indoor kitchen, complete with water, electric, gas, and lighting. We even do stone pizza ovens! Whether you’re preparing for a family dinner or a huge dinner party for you and your 20 closest friends, an outdoor kitchen is the perfect place for everyone to gather. Guests can mingle and relax, and the cook gets to be part of the festivities instead of hiding away inside. Some yards we work with are blank slates; they have no existing outdoor living areas. Others have some basic features in place that we can use as a foundation to create a more attractive, more functional area. Perhaps you’ve already got a sliding door that leads to a patio. With a few new accents or features such as a pergola, or a stone wall with a raised garden bed, you can have an outdoor room that’s connected directly to your home. Adding additional landscaping elements such as creative outdoor lighting and a fireplace or a fire pit will take that outdoor living room from functional to fantastic. The best outdoor living areas can provide multiple options for entertaining, gathering the family, or just relaxing. Whether it’s tea with friends among the flowers or a small oasis for a backyard camp out with the kids, we can create small, special areas in your yard. Custom furniture, lighting and interesting plantings all work together to provide the perfect place for light socializing. Outdoor bars are quickly becoming a popular choice, either as part of an outdoor kitchen set-up or as a stand-alone feature. From a simple stone counter top to a full station including water, sinks and shelving, an outdoor bar is sure to add an extra sense of affluence to your property. Maybe you need a reading spot or a place for morning meditation. Through the use of arbors, trellises and creeping plants, we can create shady spots perfect for a little downtime surrounded by natural beauty. From extended patios for pool furniture to fire pits, poolside bars and waterscaping spaces we can help you turn your regular pool into an at-home resort location. We love adding a little something extra to what might be the most luxurious feature of your property. Some of our outdoor rooms are created around decks, but the majority of our custom designs are based on a stone or brick patio. Adding stone walls for seating or pieces from our custom stone furniture line is a natural fit for this look. 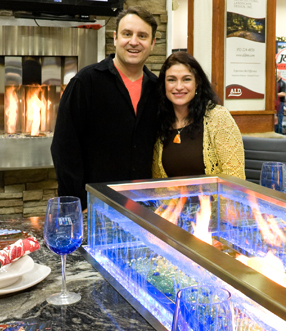 We also recently introduced our patented “Elements” Fire & Water table at local home shows. This multi-functional table could be used poolside for refreshments, as a dining table in your outdoor kitchen and dining area, or as a conversation center in an outdoor living room. To find out more about our custom furniture for outdoor living spaces, includng more about the “Elements” Fire & Water table, click here. Why waste a minute of nice weather once it comes along? With outdoor living, you’re not stuck indoors to cook, eat, entertain, or relax. When it comes to designing an outdoor living area, we’ve got so many options to work with. We’d love to sit down with you and talk about creating the perfect outdoor space for you. All of our no-obligation consultations are free, so give us a call at 952-242-9368 or email us to schedule your appointment today.